Cybergun has continued to produce licensed SIG Sauer replicas through various manufacturers, and the IPSC X-Five by KWC is one of the latest to hit the market. This full metal GBB pistol is powered by CO2, and features race gun style features, including adjustable iron sights, a barrel mounted compensator, extended magwell, and a removable scope mount. This pistol is pretty much competition ready out of the box, and I will discuss all of the various aspects of this pistol in this review! I obtained this pistol through Pyramyd Air, where it is currently available HERE, priced at $127.50, qualifying it for their free FedEx ground shipping. The price includes the scope mount and compensator, as well as a single CO2 magazine. You will need to add CO2 cartridges and BBs to complete your package, but otherwise, the gun is ready to roll! Note, the optic mounted on the gun in the first image is not included, so if you wish to attach an optic to the included mount, you will need to add one as well. The X-Five is modeled after an IPSC open class prepared SIG Sauer X-Five, which is SIG's answer to other companies' factory race gun efforts. SIG designed the gun with competition shooting in mind, with some of the more practical features (decocker, etc) removed, and race ready features installed in their place. KWC replicated the overall layout of the pistol quite well, and Cybergun provided their licensing to make this gun unique, sturdy, and complete with legal trademarks. Cybergun and KWC packaged the X-Five in a full color cardboard box, with images of the gun emblazoned on the front. Everything is protected in their own section in the foam lower section of the box, and it survived shipping across the country just fine. Along with the pistol, the package includes the metal scope mount, the attached compensator, a single magazinein including a spare screw-on CO2 base, a few allen wrenches, and a small package of BBs. The spare CO2 base is a great touch, in case one of them breaks during use. The X-Five is a full metal pistol, and the only non-metal parts are the trademarked grip panels. The fit and finish are pretty good, with some slide and barrel freeplay, but nothing that really seriously detracts from the overall quality of the gun. The satin black paint looks great, and has a very slight texture to it. The grips are very comfortable to hold onto, and are finished with textures side panels. The front strap is also checkered, to ensure that you can keep a great grip on the gun when you shoot. A great touch is the beveled magwell extension, which assists you in rapid magazine reloads. The frame is slightly longer than a standard 226 frame, however the controls are largely the same. The major exception is the lack of a decocker lever, and the addition of ambidextrous safety safety switches. The slide lock release as well as the takedown lever are largely unchanged, making the transition from a P226 to the X-Five quite easy. The real gun is single action, however, the replica is double action. 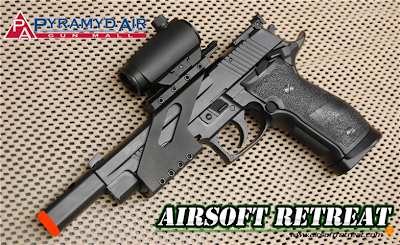 The slide, like the frame, is slightly longer than a P226, which gives you a longer sight radius than normal. It also features front and rear slide serrations for easy cocking. The metal quality is quite nice, and it hasn't shown any wear after my testing so far. The outer barrel is terminated in a metal compensator, which itself is topped off with a plastic orange tip. The orange tip is securely glued in place, however, I removed mine for this review. The compensator can be removed, however, the locking screw is filled with glue, which needed to be cleaned out with a dremel tool before I could unscrew it. Once removed, you can see the 14mm+ threaded muzzle which is installed on the metal outer barrel. The target style iron sightsare adustable for windage and elevation. The front sight is removable, and is secured using a spring loaded metal nub. The main body of the rear sight is molded into the slide, however, the adjustable portion can be removed. It appears to be the same as Hi-Capa adjustable sights, so you should be able swap it out with a charging handle for race use. Of course, one of the main selling points of this gun is the included 20mm scope mount, which attaches to the lower dust cover rail. It is full metal, and mounts up very securely to the frame using four cross bolts. As mentioned previously, the gun has licensed SIG Sauer trademarks, including laser engraved markings on the slide, and molded in logos on the grip panels. The included magazine is full metal, holds 24 rounds, and unlike most other CO2 magazines, is pretty much the same size as a normal GG/Propane magazine. The CO2 capsule is secured by a screw on base, which uses a hex wrench to unscrew it. In my testing, I've been able to get about 60 rounds per 12g CO2 capsule, which is pretty good considering it's a GBB replica. Unfortunately, it is not compatible with KJW SIG P226 magazines, as they are slightly different in pretty much every dimension. I believe that KWC GG/Propane X-Five magazines will work in this gun, but I am waiting on one to arrive to check it for sure. Accuracy and range were good, due to the full length inner barrel, and effective BAX hop-up system. For range testing, I used Echo 1 .28g BBs, with the hop-up cranked up pretty high to give me a flat trajectory. I was able to hit my standard torso sized target at 110' 90% of the time, which is quite good for a stock pistol. Cool down isn't too bad, and consistency is quite good, which is critical for competition shooting. Disassembling the gun is a piece of cake, however, the scope mount must be removed before the slide can be taken off. All you need to do is pull the slide back, and flip the takedown lever down, which will allow the slide to come off the front of the frame. You can now access the inner barrel, adjust the hop-up, or lubricate the blowback mechanism. The gun is equipped with the BAX system hop-up, which is basically a split nub V-hop. This gives you great side to side consistency with your shots, and a better accuracy at range. The recoil rod is fitted with a dual spring system, which helps cushion the recoil force from the CO2 power. It also is fitted with a small nub that fits inside a corresponding notch in the barrel, to make installation a piece of cake. The blowback system is largely comprised of ABS plastic, however, it seems to be taking the power of from the CO2 magazine with no issues so far. Keep in mind, CO2 is a dry gas, so you will need to add silicone lube to your magazines every once in a while. Inside the frame, you can access the hammer and trigger mechanism for easy lubrication. Honestly, this thing is pretty much customized to my liking as is, however, I will be adding a cocking handle to the rear sight unit, and I have added a G&P T1 replica to the scope mount. I love IPSC style weapons, and normally, you have to spend a fair bit of money and time building one. KWC and Cybergun put together a great little package with this gun, as it certainly has the race gun look out of the box. For serious competition use, you will need to do some internal tweaks, but it's a great starting place! 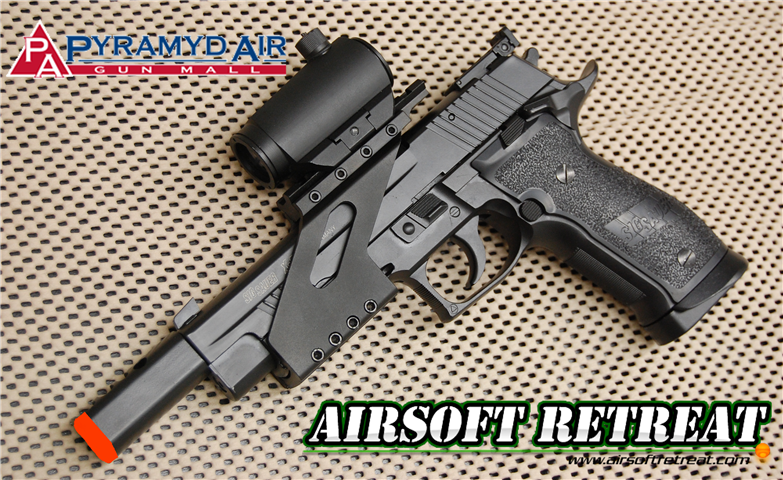 Many thanks again to Pyramyd Air, and of course, Airsoft Retreat! Can you tell me if this effects the precision/accuracy? I plan to use mine mainly for indoor target shooting. I didn't see a real accuracy issues with the gun that I could attest to the barrel/slide wobble. For indoor use, the thing should be plenty accurate at the ranges you'll be dealing with.